Like all social media platforms, your Instagram profile’s success is dependent on your community. Nothing builds your relationships faster than communicating with your followers on an individual level. And, there’s no better way to communicate than by replying to comments. 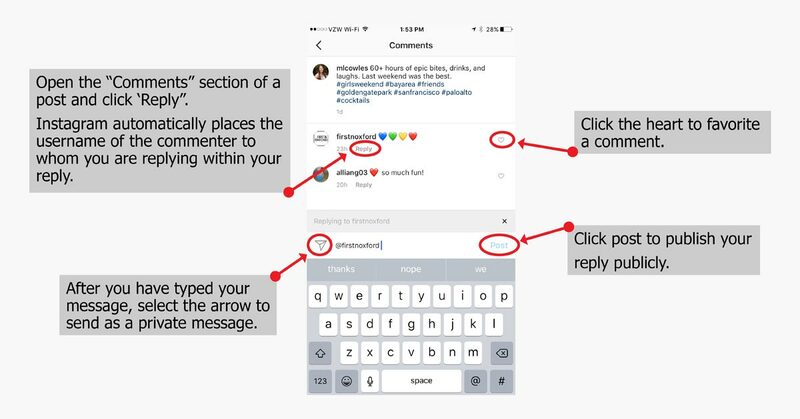 Instagram has made it easier than ever to @mention a fan in your reply. Open the comment section of your post and hit reply. The Instagram handle of the fan you’re replying to will automatically appear and then you can type the rest of your reply. Facebook makes it easier than ever to respond directly to each comment and acknowledge the comment, by favoriting it. In addition to replying to comments, hit the heart icon to the right of the comment. This will alert the fan that you have liked their comment. But, not all comments are created equal - especially on social media. Below we've outlined seven types of Instagram comments you're likely to encounter and how to reply to them. Also explore how to reply to Facebook posts. Typically, compliments are the most common comment you’ll receive. Compliments can range from simple praise of your artistic perspective to appreciation of your inspirational quote. In general, saying a simple “Thanks” will do. However, the more detailed the compliment, the more detailed your response should be. If a comment addresses specific aspects of your photo or caption, you’ll want to address these aspects. If there’s an opportunity for you to ask a question in response to their comment, that’s even better. Asking questions is a great way to spark a dialogue, which is when real relationships start to form. Exception to the Rule: Spam Compliments Spam compliments come from questionable accounts that are typically looking for followers or trying to proposition johns. They’ll often leave comments like, “great pic! Follow me back!” or “awesome photo. let’s connect”. It’s best to ignore or delete the comments. You can also ‘Report’ the account for inappropriate activity and ‘Block’ the account from accessing yours. When a fan asks you a question, they’re showing a deeper level of interest. Don’t overlook this. Make sure to respond. If you don’t know the answer immediately, acknowledge their question and let them know you’ll get back to them. If the question is personal in nature, try to move the conversation into a private message by alerting them that you’ll be direct messaging them. A fan responded to your question? That’s fabulous. Don’t let the momentum end. Acknowledge their response. If appropriate ask them a follow up question. Did a fan use Instagram as an opportunity to complain about your business? Don’t just ignore the complaint. Make sure to respond to the comment. And, if possible, move the conversation into a private setting. For instance, you may reply to the comment with a phone number or email address, inviting the fan to connect with you personally. Sometimes fans will @mention their friends on a post. Like compliments, this type of comment is quite common. Often, a fan will just share the Instagram user’s name. Other times, they’ll include a question. For example: @friend shouldn’t we do this? We don’t recommend responding to just the mention of a name. If there’s more to the comment though, it can be worthwhile to respond. Take the above example, you might respond by saying: @fan & @ friend we vote yes! Bonus Tip: If your post is about a product or service and the person tagged responds with a positive affirmation, you may consider direct messaging both the original fan and the tagged fan with a discount code. One of the way spam accounts attract attention is by mentioning other users in their posts. There’s not a lot you can do about these annoying mentions except block the account. Click the three dots in the top right corner of the user’s profile. Then select “Block”. 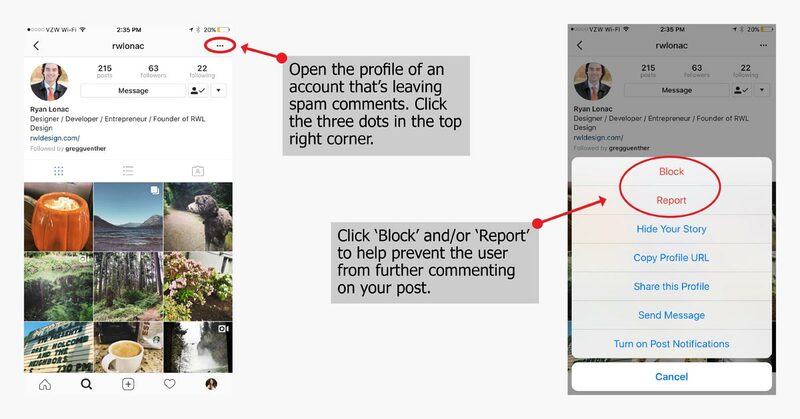 When a user is inappropriate, blocking them and reporting them to Instagram can offer relief. Did a user mention you in a comment on someone else’s picture? This is an instance when you don’t always have to respond. Use your best judgement. If you do reply, you’ll want to hit “reply” as you would with a comment on your own picture. This will alert both the person who mentioned you and the person whose post on which you’re commenting. Have additional questions about Instagram? Let’s talk.